Arthritis, a medical condition that involves damage to the joints of the body, takes more than 100 forms and affects tens of millions of Americans. 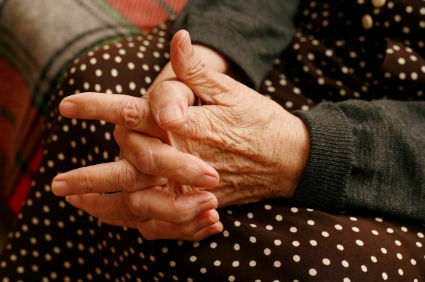 Osteoarthritis, the most common form of arthritis, is a degenerative disease. Arthritis gets worse with age, but you can slow its progression with specific courses of treatment. 1. Learn about arthritis. You need to understand what is going on with your body in order to understand your treatment and recovery processes. Call the Arthritis Foundation at (800) 283-7800 if you need more information about the condition. 2. Talk to your doctor about available treatment alternatives. Your doctor can explain what is going on with your body and give you advice about what treatment to follow, what diet to adopt and what physical exercises you can practice. Also ask your doctor if you qualify for any type of surgery that corrects deformity that osteoarthritis causes. 3. Movement proves very important in treating arthritis. Find a physical activity that doesn’t make your joints hurt and exercise for one-half hour every day. Undertake physical therapy or find out if a hospital near you has hydrotherapy classes. Hydrotherapy involves exercising in water, and it’s beneficial for arthritis because it releases pressure from the joints and makes movement easier and less painful. Always keep good body posture and use your hip muscles, not your back muscles, when lifting something heavy. 4. Sleep well and get at least eight hours of sleep at night. The body recovers while sleeping. Also make sure you sleep on a firm surface and avoid sitting in soft chairs. 5. Gently exercise your affected joints for 10 minutes, a few times every day. Don’t make sudden and painful movements; instead, just slowly elevate the joints. 6. Warm compresses help release pain from painful joints. Keep the warm compress on for 20 minutes. When you go outside, wear warm clothing since the cold makes joints more painful. 7. Extra weight puts a lot of pressure on the joints, making them degenerate faster and causing you pain. If you are overweight, maintain a low-carb diet and try to lose as much as you can from the extra weight. 8. Find relaxing activities, such as doing yoga or listening to soft music. The more relaxed your body, the less pressure muscles put on your joints. 9. Doctors usually prescribe aspirin for releasing pain arthritis causes. If for any reason you don’t tolerate aspirin, try indomethacin, ibuprofen or naproxen. Don’t take medication without talking to your doctor first. 10. Alternative medicine can help with treating arthritis. Some arthritis patients say they get good results from acupuncture. Acupuncture, an ancient Chinese technique, involves inserting very thin needles in the patient’s body. It causes the body to relax and stimulates circulation. Find a qualified acupuncturist in your area and discuss your condition to formulate a treatment plan.